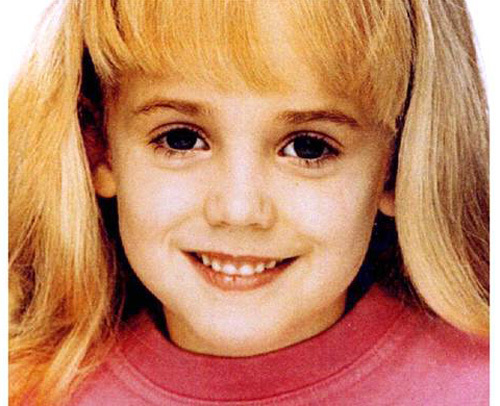 Yesterday was the 20th Anniversary of the JonBenet Ramsey murder. To this day this heinous crime remains one of the most perplexing and closely followed cases known to society, and assuming it is ever solved it will garner the attention of most of the world. In light of that, it should not be surprising to anyone that there are an impressive number of people and organizations who not only follow the case, but also have strong opinions on what happened, how the investigation was carried out and what the motives may have been for the various people involved in JonBenet’s life at the time – all of whom have been considered as possible suspects. Needless to say theories abound but there are those that have legitimate analysis of the case and are more than worth considering. With that in mind we are re-posting the latest mention of the case by our friend Alice of Defrosting Cold Cases, whom we consider one of the foremost experts in analyzing cold cases. If this case were ever officially re-opened we would highly recommend she be involved along with a number of other experts, including those of AISOCC. Also, as we have learned recently, there are numerous pieces of evidence that are closely tied to this case that have either never been tested for DNA, or have been tested using a traditional method that did not yield actionable results. All of those items should be re-evaluated with the M-Vac System in mind. The M-Vac is by far the most effective and thorough forensic DNA collection tool available and combined with the sensitivity of the latest lab equipment and processes it creates an astonishingly powerful asset to any investigation. The M-Vac has already proven itself by collection sufficient DNA material from bricks, rope, blankets and numerous clothing items, all of which produced viable profiles. Some or all of those successes may have relevance to this case. There are agencies using the M-Vac that are having up to a 70% success rate, even after a traditional method such as the swab has already been tried on the items. Based on that, just as the M-Vac should be considered as a DNA collection option in every case, we highly recommend using the M-Vac on the JonBenet case as it likely could help produce data and results the investigation currently does not have. To date there is no other tool that even comes close to the collection capability of the M-Vac, so of course it should be utilized where appropriate. The bottom line is: If there is DNA material on the evidence, the M-Vac System holds the best chance to recover it. Lastly, M-Vac Systems and one of our close associates made a brief appearance on an online radio show yesterday to discuss what the M-Vac is and how it has helped solve other cases. Being the 20th Anniversary of the JonBenet murder much of the show was dedicated to discussing the details of the case and possible motives etc. As an outsider and non-investigator, we tried very hard not to give our opinions, but simply to provide details of what the M-Vac can do based on research, validations and casework. Opinions and conclusions based on the information we provided are up to the individual. To listen to the show (Tom Sumner Program) click here. You may find the discussion interesting and possibly compelling. Like so many of you I watched the two CBS specials on the JonBenét Ramsey case. A lot became clearer but I am still foggy on many issues. I am not going to summarize the crime as it is well-known. If you are not familiar with this case, click here. the 911 call: when you call 911 you know you are calling emergency services so it is basically “cut to the chase.” I expected the first sentence to be “JonBenét is missing, help!” The other part was that right in the beginning I hear (and correct me if I am wrong) “we need an… police.” Did she intended to say “we need an ambulance?” and then caught herself and said police? Maybe I am reading too much into this. The subtitles in the clip only start at “police” and do not catch what was said before. Last, I’d like someone from a foley department to listen to the tape and see what they recognize. what does S.B.T.C. stand for? I asked some readers on my blog’s Facebook page and they gave interesting answers. One said it is “saved by the cross” and another said “Serbian Bosnian Terror Cell.” Another mentioned “Subic Bay Training Center.” On Twitter, someone pointed out that John Ramsey’s bible was found open to Psalms 35 and 36. The first four lines start with the letters CTBS so reversed that is SBTC. Maybe too far-reaching but I cannot disregard it either. the underwear: has anyone checked whether JonBenét was dressed in brand-new underwear or in already in use underwear? If it was brand-new then Dr. Lee’s remarks about transferred DNA and contamination during manufacturing and packaging make perfect sense. However, if it was already in use underwear (e.g. laundered several times at home) it could make a difference. the suitcase below the basement window: has anyone tried (with a dummy, of course) whether a child the size and weight of JonBenét fits inside that suitcase? Does that suitcase fit through the basement window? smearing feces around the house is very disturbing behaviour that reflects inner turmoil in the child. I wonder about his behaviour at school and during after-school activities. If you wish to post your thoughts please do so on the Facebook page, link here. There is an interesting discussion going on. By mvacjb2014 in Uncategorized on December 27, 2016 .